(From Tamron lens literature) This zoom lens from Tamron covers everything from the 24mm real wide angle that professionals and serious amateurs demand, to 135mm telephoto suitable for portraits: all in one compact package. The first SP lens among Tamron's high power zoom lenses, the lens represents a new concept in high power zoom lenses, achieving outstanding performance characteristics worthy of the name SP (Super Performance). This lens was a somewhat vexing one to test, as it consistently showed problems caused by AF accuracy issues between it and the 20D body in our lab. (Which seems to focus pretty well with most other lenses.) Our micro focus-bracketing protocol eventually dealt with these nicely (as evidenced by the excellent agreement between results on the 20D and 5D bodies), but crossed wires internally resulted in the micro-bracket tests not being run at 24mm on the 20D body. As a result, the results at 24mm and f/2.8 shown at right probably don't represent what the lens can do on sub-frame cameras. We've left the 24mm results in the interactive viewer for APS-C sized sensors at right, but suggest for now that you actually look at the central portion of the full-frame blur plots (where it actually does surprisingly well across the entire frame) to get a better idea of how tthe lens performas at wide angle and large apertures. AF issues aside, this lens is an ok performer wide open but did show some significant softness on the left side of the frame at 35mm and 52mm focal lengths on the sub-frame body. Closing the aperture just one stop made for substantial improvements in sharpness, with good to very good sharpness in the middle of the frame, and only minor softness in the corners and edges. Two stops down, it gets sharper yet at wide and medium focal lengths, but softens slightly due to diffraction limiting at the telephoto end of its range. Chromatic aberration is quite good at lower focal lengths, but begins to increase at maximum aperture around 100 mm, and is quite high when shooting wide open at 135mm. Here again though, stopping down just one f-stop brings considerable improvement, although CA remains on the high side of average at 135mm. Light falloff in the corners (aka "Vignetting") was surprisingly good across the board, in all cases less than 1/4 EV, and most of the time much less. Geometric distortion was on the low side of average, peaking at about 0.7% barrel at 24mm, falling to nearly zero at 35mm, and then gradually increasing to a maximum of about 0.3% pincushion at full telephoto. All in all, this is a good lens for sub-frame cameras, at a good price. As is generally the case with inexpensive lenses, it will do best if you can afford to stop it down by one or two f-stops, but when you do so, it will reward you with very good images, at an affordable price. Light falloff ("vignetting") and geometric distortion were also rather high on the 5D, with falloff of more than 1 EV at 24mm wide open. At 24mmm and f/5.6, the shading dropped to about 0.6EV, still a rather high value. Vignetting dropped rapidly at longer focal lengths though, never more than 1/3 EV from 35-135mm. Geometric distortion was just over 1% barrel at 24mm, dropping rapidly to 0.5% pincushion at 35mm, and reaching a maximum of about 0.8% pincushion somewhere around 74mm. This lens is a real bargain for sub-frame shooters, but more of a marginal proposition for those with full-frame cameras. It will produce reasonably sharp images when stopped down somewhat, but geometric distortion and chromatic aberration in the corners remain high at the extremes of its focal length range. very small and light,excellent for travel and walkabout, surprisingly good IQ, great aperture ring, well placed focus and zoom rings. IQ a bit soft at 24mm, have to stop it down. minimum aperture of 5.6 makes it a bad choice for protraits or low light. I bought this lens 100 on ebay UK. Never regretted it, it was originally meant to use at Land Rover events where I had dropped the Tamron 35-135 once too often in the mud. Soon I realized that in most circumstances I could use it instead of the bulky 24-70 whilst also getting sortof a portrait range. It doesn't replace everything but it is much better than you might think and it has survived many building sites, towns, 4x4 meetings and much more. Makes an excellent complement lens for a 180 or 200 macro or you bird lens if you need the odd habitat shot or simply spot a great landscape. An extremely portable all-in-one FX travel lens with very good optical performance across the whole zoom range. It always delivers excellent center and border sharpness even wide open (the performance at wide-end is better than the tele-end). Extreme border sharpness can be improved by stopping down 1 to 2 f-stops. The lack of VR and AF-S is expected. But then it would be more durable and long lasting. So far, the major drawback is the distortion at the tele-end. Though it can be fixed during RAW file conversion (I only shoot RAW). One score was deducted for the sake of distortion at the tele-end. All in all, it's a real SP level zoom. This is my D700 kit lens! This is the lowest priced zoom lens in its class and the IQ is much better than the Canon 28-135mm, which i had used before. As you zoom in to 100mm and greater focal length, the image quality diminishes a bit, but if you drop it to f/7.1 (the sweet spot for this lens) the images will still be crisp. At 135mm, the AF can be a little slow. Also the zoom ring is very stiff and laborious to turn compared to Canon lenses. Overall, I am happy with this lens for a 'walk around' lens. I've been using this in on my Canon T2i and am very happy with it. Unfortunately, this lens is discontinued and you will have to purchase this used. I owned one of these for a few months at the beginning of 2009, after reading a favourable review at Photozone.de. I went on holiday to Morocco and needed a "do-everything" lens for my Canon 5D, and this seemed a good choice. On a full-frame camera the focal range is almost exactly the same as the modern, Canon 15-85mm EF-S. Unlike the newer lens it does not have image stabilisation. The lens is only available on the used market and cost me round £120. It's an older design that dates from 2000 - it was released as part of Tamron's 50th birthday celebrations and as far as I can tell every one has a special "50th Birthday" logo on the lens cap. I used it mostly at 24mm, and it was very sharp in the middle at f/8. Towards the corners, the outer 15% or so were soft and the very extreme 5% was muddy and had very noticeable vignetting. There was also noticeable barrel distortion, although correcting this had the positive effect of cropping off the muddy corners. Up until about 60mm it remained good but suffered from obvious pincushion beyond that. F6.3 at 135mm was unimpressive around the edges but still decent in the middle. 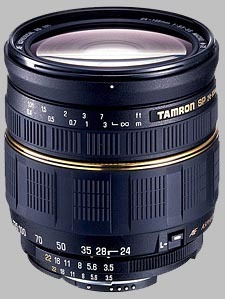 Zoom lenses that start at 24mm are fairly rare and I suspect Tamron wanted to beat the range of Canon's 28-135mm. This is a shame, because if Tamron's lens was restricted to 24-105mm (say) and optimised for those focal lengths it would deserve a few more stars. On a physical level it felt well-made, and my sample was thankfully free of dust. It had a turn-zoom design. Mechanically, the focus mechanism whined a lot but focused accurately. Unfortunately the focus ring is coupled to the autofocus motor and rotates as the lens focuses, which means that unless you hold the lens daintily by the zoom ring only, the focus ring will catch your hand. And because the focus ring is covered with grippy, ribbed rubber, it'll hurt! It's a girthsome lens that extends as you zoom in. Ultimately I got fed up with the bulk, and because I used it at 24mm most of the time I sold the lens and opted for a 24mm prime. It's often compared with the Canon 28-135mm, which is slightly less wide, apparently not quite as sharp, but has image stabilisation. A bit slow. But if made faster, it would cost MUCH more. I hesitated for some time, before pulling the trigger on this purchase. My mistake. I promptly burned two rolls of fine grained film with it, and the results are VERY good. Upon glassing the negs, (10x loupe on light table) I found the negs to be very sharp and defined. Great color & contrast. I used it on the F100 body, and had no issues with focusing. Quite fast. It's not too heavy or awkward. It very well, will probably become my "go to" auto-focus lens. It's much better than both versions of the Nikon 24-120 lenses. At short focal lengths, up to 70-80mm, this lens is very sharp even wide open. Longer than that, it loses detail, particularly at infinity focus. Build quality is good though, and the focal range is very useful even on a crop sensor camera. Not a good lens for portraits, since the bokeh is ugly and takes attention away from the subject. Good build quality and compact size when not extended. This lens provides a very useful focal length range, although the 24 mm wide end is sometimes not quite wide enough on a 1.6-crop camera. The lens is surprisingly sharp, losing only a little bit at the long end, and the build quality is probably the best among all the Tamron lenses. I had the chance to test this lens on my 300D camera. The construction was better that any previous lens and the image quality also was very good. The range recommend this lens as general lens, for landscapes, portraits. It also does some macro, very god for flowers and small objects, but it is not 1:1 life size. What I miss is the IS, so handheld could be a problem especially in low light, but on a tripod it is always excelent. Solid all metal build, Good range, marginally better optics than Canon equiv. Weight, no IS, slower AF. If you are looking for the perfect walk around lens and the new 24-105L lens is out of your price range, then this is your best bet. I've had this lens for 2 years and the all metal body gives it that sold L feel and durability. The lack of IS maybe a drawback, but the optics are above the Canon 24-135IS at half the price. AF speed is average, not available in HSM/USM.